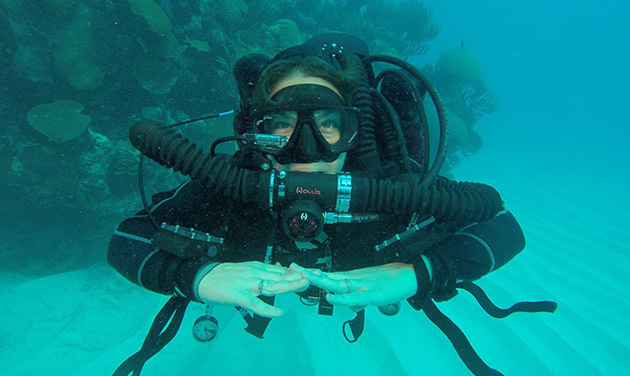 A global marine research project designed to justify marine protected areas worldwide is set to launch in Bermuda next spring and will include the expertise of BIOS coral reef scientist Gretchen Goodbody-Gringley. The collaborative project, called Ocean Tech, will utilize the Woods Hole Oceanographic Institution underwater robotic vehicle REMUS. This vehicle, equipped with cameras, navigational, and scientific instrumentation, is capable of autonomously tracking marine life to provide visual and scientific data that will reveal how marine species, from rays to sharks, use their reef environment. One goal of the project is to share collected data with policymakers, both locally and internationally, to help justify the establishment of marine protected areas. The project’s global media campaign will include feature-length documentaries, a school education program, international and local exhibits, globally broadcast lectures, summer camp programs and experience days. “The aim is to inspire and educate a global audience about ocean conservation,” said Andrew Smith, Ocean Tech’s executive director. Goodbody-Gringley, whose research focuses on understanding how coral reef ecosystems function to maintain biodiversity, was contacted by Ocean Tech at the start of the year to collaborate as chief scientist and help formulate the project’s research design. “Gretchen’s unrivalled understanding of coral reef ecosystem function will continue to strengthen our ability to make sound research decisions and ensure that we make the most of this unique opportunity,” Smith said.